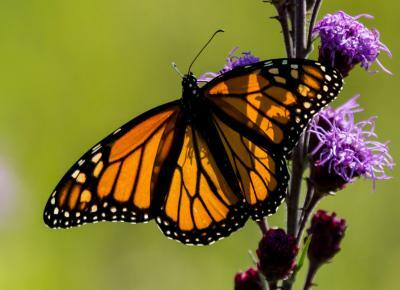 AMES, Iowa – Determining the right mix of perennials to use as habitat for monarch butterflies and bees can be challenging. Researchers with Iowa State University Extension and Outreach have worked to provide a mix that provides a diversity of flowers that bloom throughout the growing season. This information is available through a new ISU Extension and Outreach publication titled “Monarch Seed Mix High Diversity” (ENT 0047) and is available through the Extension Store. The publication and seed mix were developed by Seth Appelgate, Sue Blodgett, Steven Bradbury, Diane Debinski, Robert Hartzler, John Pleasants and Dana Schweitzer with Iowa State and Richard Hellmich with USDA-ARS. All perennials in the mix are native to Iowa, including three species of milkweed, which is the monarch caterpillar’s only host plant. The mix also contains nectar-producing species that benefit butterflies as well as many pollinators, such as bees. “A robust seed mix that contains a variety of species is important because it allows for establishment in a wide variety of environments,” said Appelgate, agricultural specialist with Iowa State. The species included in the mix were selected to perform in well and moderately well-drained soils. The mix has been planted at ISU Research and Demonstration Farms, as well as on private land in cooperation with farmers and landowners throughout the state. The publication also includes a chart showing the months when specific grasses and forbs from the mix will bloom, as well as forb flower color. Iowa State University is not directly selling this seed mix but the list of species can be purchased from native seed suppliers in Iowa.